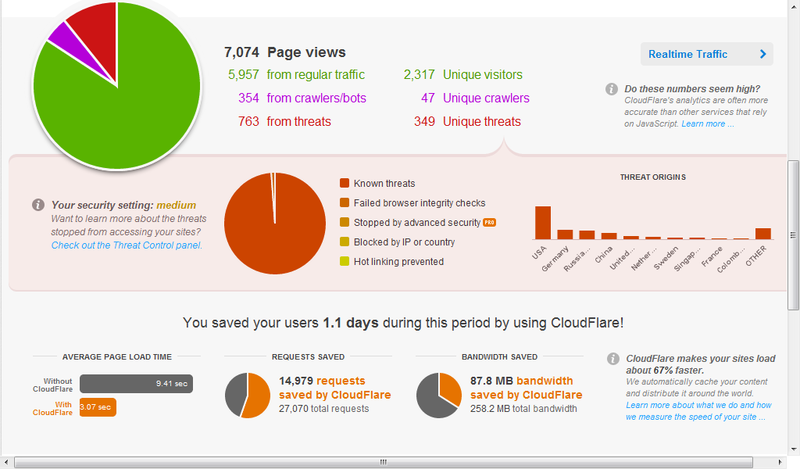 A few days ago I posted about how I was going to be testing CloudFlare on this site. About 10% of visits were known threats, usually comment spammers but occasionally automated exploit hack attempts and botnet zombies. These are blocked from getting to the site. I’ve received no complaints from legitimate users, either by email or through the CloudFlare messaging system (it shows up for blocked visitors), which is an extra plus. So far, things look quite promising. It may be more effective for more traffic-heavy sites than my own, but even for a small site like this one it’s saved a bunch of resources.